Tampa Archives - Jewish War Veterans of the U.S.A.
Post 373 was founded 31 May 1949, in Tampa, Florida, and is named for Albert S. Aronowitz, son of Emanuel and Rose Aronowitz. Albert was a PFC with the 135th Infantry, 34th Division, in WWII. Albert died on June 1, 1944, of wounds sustained at Anzio, Italy. He was 21. We are a small post with a big mission: to support ill and paralyzed veterans. We work closely with the Spinal Cord Injury Unit at the James A. Haley Veterans Hospital and the Haley’s Cove Rehab Center and Nursing Home in Tampa. We take our ill and disabled vets to many outings, such as baseball and hockey games, museums, state fairs, MOSI (Museum of Science and Industry), auto shows, aquariums, lunch at local restaurants, and many other events. We also provide them with everyday needs, as well as periodic entertainment. We also have a large presence in the community. We provide an Honor Guard for the Tampa Bay Lightning and the Tampa Bay Storm, both at the Amalie Arena in Tampa; the Tampa Bay Rays at Tropicana Field in St. Petersburg; and the local JCC Israel Independence Day celebrations. We participate in the Massing of the Colors in St. Petersburg as well as activities at MacDill AFB. For Memorial Day and Veterans Day, we place flags on veterans’ graves in various local cemeteries. We hold various fundraisers on those occasions to help support the post’s activities for the veterans. We were recently chosen to provide the Honor Guard for one of the Lightning play-off games (see photo taken prior to moving onto the ice – from left to right, Peter Stark, Larry Jasper, Sonya Bryson (who sings the National Anthem), MacDill Wing Commander Air Force Col. April Vogel (honored guest), Jim Marenus, and Georgi Jasper). Our monthly meetings are held on the 3rd Sunday of the month in the SCI (Spinal Cord Injury) unit of the James A. Haley VA Hospital, 13000 Bruce B. Downs Boulevard, Tampa, Florida 33612. Bagels, lox, cream cheese and other items are available at 9:30AM and the meeting starts at 10:00AM. 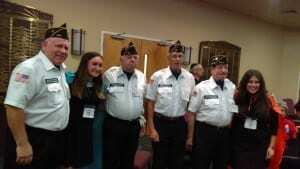 We are honored to have 2 members who are WWII veterans and we have members who have served in all conflicts since WWII. One of our WWII members served in the liberation of France and at the Battle of the Bulge. He was recently honored by the French government for his service.